Low pressure in the engine can be indicated by flashing or constantly switched on engine oil pressure caution lamp. This can be particularly observed after the engine is completely warmed up. After the full treatment and 2,500 – 3,100 miles of run the slight wear of the linings, crankshaft rod journals and parts of the oil pump restores completely and the oil pressure normalizes. Oil is diluted by the fuel or cooling agent. 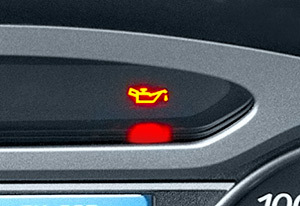 Motor oil dilution may be caused by the fuel in case of the injection nozzle dysfunction which will be indicated by the caution lamp flashing at idle. Atomex Complex Oil Treatment, an antismoke additive with Revitalizant®, is recommended to be added. At the same time add to the fuel tank Verylube Complex fuel system cleaner for fuel systems according to the type of the engine whether it’s diesel or gasoline. Finally after usage of the previous products, it is recommended to introduce: Revitalizant® EX120 for fuel equipment, Revitalizant® EX120 for diesel engine and Revitalizant® for Diesel Truck fuel equipment. Cleaning and fuel treatment with XADO Revitalizant® help to renovate injectors or injection nozzles and prevent penetration of fuel into the motor oil. In case of fuel dilution with the cooling agent repair of the engine is required. Low oil level in the engine lubrication system. In this case just fill up the oil up to the goal. High resistance of oil filter. If there is a decreased pressure due to high resistance of the oil filter install the oil filter of the recommended type. Failure of the oil pressure sensor. In this case the sensor should be replaced. Sticking of the oil pressure reducer in the engine lubrication system in the open position. Stuck oil pressure reducer should be replaced. Note In the case of severe pollution of injectors in the gasoline engines, XADO MaxiFlush is recommended. The product is a cleaning agent for flushing on the stand or as an additive for fuel injectors cleaning during operation. Atomex Complex Oil Treatment is a fully synthetic product that is represented by the polymer thickener, which increases viscosity of oil thus restores oil pressure. The product is compatible with all types of motor oil and is safe for turbocharging assemblies. It can be applied both in gasoline and diesel engines. In the case of severe pollution of injectors in diesel or petrol (gasoline) engines, XADO AtomEX Multi Cleaners are recommended. The product is a cleaning agent for flushing on the stand or as an additive for fuel injectors cleaning during operation. 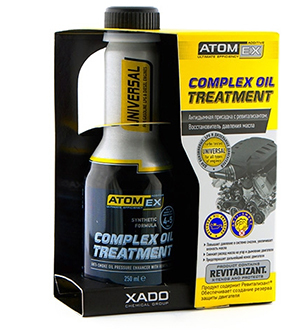 Atomex Complex Oil Treatment is a fully synthetic product that is represented by the polymer thickener, which increases viscosity of oil thus restores oil pressure. The product is compatible with all types of motor oil and is safe for turbocharging assemblies. It can be applied both in gasoline and diesel engines.